All our tanalised sheds are delivered flat packed with ready built side walls, floor panels and roof panels. The floor and roof sections are constructed from timber not sheet material. The felt for the roof comes ready cut to size and our sheds are supplied with glass for the windows. All fixings and instructions are supplied on delivery. With extra height, thicker cladding, heavy duty (HD) framing and a variety of eye-catching cosmetic features like mortice and tenoned windows and door this really is a luxury ‘built to last’ shed with added style. Sizes: 7’x5′ to 16’x8′ models available. Door: door can be positioned at either end. 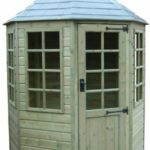 This stunning model makes a decorative centre piece for any garden with a simulated slate roof, which is moulded from one piece of maintenance free fibre glass, making this building truly unique. Sizes: 6’x6′ with single door and 8’x6′ with double doors available. All of the tanalised sheds from Oakdale Fencing are vacuum pressure treated with a environmentally friendly chemical preservative compound. This treatment significantly increases the life expectancy of the shed. By pressure treating the shed it ensure that the wood is protected right through to the core. The treatment consists of anti-fungal, insecticide compounds and a preservative that promote durability and long life. All the tanalised sheds from Oakdale Fencing are manufactured to the highest standard. We only use wood from sustainable forests that are treated with quality products and preservatives. As our sheds are already tanalised, it means that no further coatings, painting or protection is required. 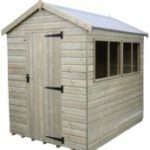 We stock a variety of different styles of tanalised sheds, available in a number of different sizes to suit any garden. Where to put a Tanalised Shed? Tanalised sheds are ideal for outdoor use in domestic gardens or outdoor commercial areas. Their longevity and lack of maintenance make them ideal for every day domestic use. Depending on the size of your tanalised shed, you can store garden tools, bikes or other appliances in them. Alternatively they can be used as a sitting area or a place to relax in your garden. Usually tanalised sheds are placed in the corners of gardens or close to fencing.